I was inspired to make this dish when my Dad told me that he wanted to make some spare ribs. 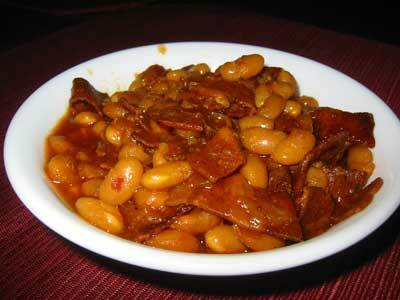 I thought nothing could go better with a hearty meal like that than some sweet and spicy baked beans. You can find Alton Brown’s origional recipie here. Soak beans overnight with the whiskey and enough water to cover the beans by an inch or so. I find that adding some whiskey to the soaking water adds an extra oaky/earthy flavor. The next morning, drain the soaking water in to a large measuring cup and place the beans in a slow cooker or large heavy pot. Top off the soaking liquid with the chicken/vegetable broth until it totals 4 cups. Cut up your bacon into half inch pieces and brown in a skillet. Add the chopped onion and cook until the onion softens and browns a bit. Stir in the tomato paste, brown sugar, and molasses. Add the entire contents of the skillet to your slow cooker and mix in well. Add the liquid, stir well, and then add a few dashes of hot sauce to taste. Simmer for about 6 hours. For the last hour of cooking, you may want to crack the lid of your slow cooker to allow some water to evaporate, thus thickening the liquid.